If we have a cloud server with a medium or high specification, we can host multiple web apps in it with different domain names for each app. If we need to host a web app backend on any cloud server, it does require an HTTP web server. The most popular HTTP servers available are Apache and NGINX. The Apache HTTP Server, colloquially called Apache, is a free and open-source cross-platform web server, released under the terms of Apache License 2.0. Apache is developed and maintained by an open community of developers under the auspices of the Apache Software Foundation. Now, Apache2 is used mostly. You can select either Apache2 or NGINX. Anyways I am covering both the technologies in this tutorial. Let’s come to the topic. We need to configure the virtual host in Apache2 to handle multiple domain requests coming to the Apache server. Here I am configuring my Apache2 virtual host for two domains syam.me and techomoro.com as I show below. You have to change the value for ServerAdmin, DocumentRoot, ServerName, ErrorLog, CustomLog based on your requirement. Now we need to restart the Apach2 server. 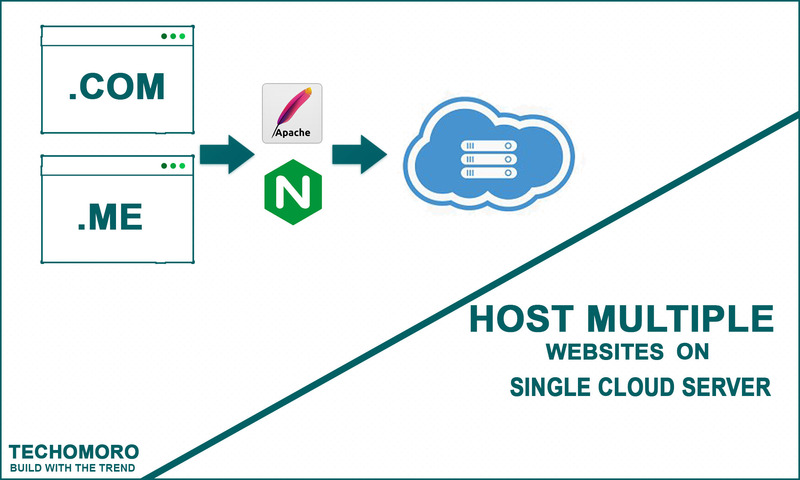 We need to configure the virtual host in NGINX to handle multiple domain requests coming to the NGINX server. Here I am configuring my NGINX virtual host for two domains syam.me and techomoro.com as I show below. You need to change the value for root and server_name based on your requirement. Now we need to restart the NGINX server. This step is working for me. Thanks.